Resolute has enjoyed a productive business relationship with the Gull Bay First Nation, near Lake Nipigon, for over 30 years. Kiashke Zaaging Economic Development Corporation harvests and delivers over 125,000 m3 of roundwood, wood chips and biomass fuel each year to Resolute’s Thunder Bay operations from the Black Spruce Sustainable Forest License (SFL). KZA is also involved in forest management activities and works on forest road construction projects. The total value of these contracts averages more than $6 million per year. Kiashke Zaaging Anishinaabek and Resolute have a long and successful history working together and we are confident that under the leadership of Chief King and his council, we can expand our relationship even further. 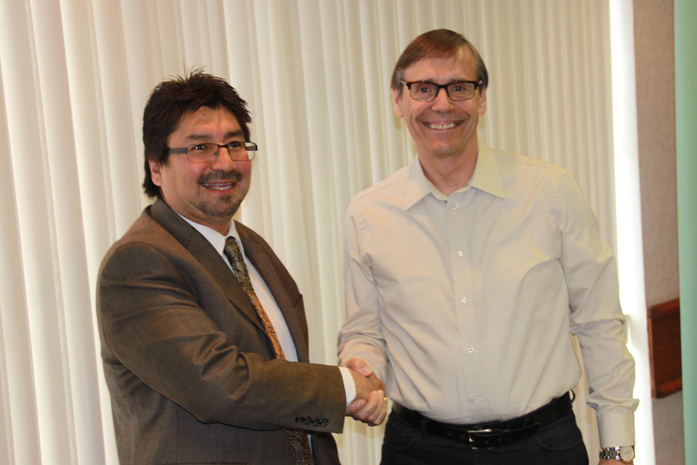 This is the most recent of several agreements and partnerships Resolute has entered into with local First Nations communities in our area of operation, and further reinforces our commitment to involving aboriginal peoples more extensively in the forest industry. More information on Resolute’s commitment to First Nations, please read our Aboriginal Peoples Policy.